Poor old Cherubini. Who remembers him today ... and for what? At best perhaps he is recalled as the Director, for some two decades, of the Paris Conservatoire; or possibly as the composer of the striking classical drama Medee, which was to become a vaunted vehicle in the 1950s and 1960s for Maria Callas ... and beyond that? Well probably not very much. In fact Cherubini was a very active and significant figure in the operatic world of the late 18th century and early 19th century, producing, between 1770 and 1815, some 32 stage works. Indeed even after the collapse of the Napoeonic order and the assumption of his Conservatoire duties he managed three further operas, his last work, Ali Baba, staged at the Paris Opera in 1833. Fundamentally serious in outlook he naturally aligned himself with the reformists and largely ignored "buffa" and "comique" types, preferring "opera seria", particularly as a platform to extend and develop the 18th century form of "tragedie lyrique". Alas he was stubbornly under-appreciated in France, and was unable to break into the inner circle of the Academie Royale/Imperiale. Indeed it was long asserted that Napoleon disliked his music, and this led to a clear antipathy to his work within the court. Whilst it was true that the Emperor preferred simpler Italianate confections, this enmity seems to be largely myth. Cherubini was appointed Napoleon�s Director of Music between 1805 and 1806, and there is abundant evidence of commissions throughout the 1st Empire. Moreover, the premiere of Les Abencerages, on 6 April 1813, was graced by the Emperor himself ... an even greater mark of approval than it might at first seem since Napoleon had deliberately delayed his departure to the crucial Eastern campaign to attend the opera. 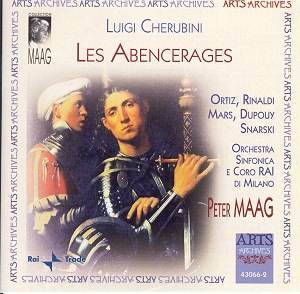 Unfortunately the popularity of the work was short lived and Les Abencerages effectively disappeared for a century and a half. It was briefly revived at the Maggio Musicale festival of 1956, in a production that united Anita Cerquetti with Carlo Maria Giulini, otherwise it has been cast to the outer reaches of the repertoire, known only for its overture and one or two of Almanzor�s arias. It would surely be a worthwhile candidate for revival at an enterprising festival such as Wexford. Part of the reason for its neglect may lie in the rather contrived libretto by Etienne de Jouy. It revolves around an ancient feud between the Moorish tribes of the Abencerragi and the Zegri. The Vizier (a Zegri) along with co-conpirators Alamir and Kaled work against Almanzor to ruin his reputation. Meanwhile Almanzor and Noraime are in love and their wedding takes place within the Alhambra, with Gonzalve, a Spanish general, as honoured guest. The ceremony is interrupted by news of an an uprising which Almanzor has to quell. He returns triumphant but in the process of victory has lost the sacred standard of Granada. Despite his claims that he passed it to the knight Octair who disappeared, Almanzor is banished. His love for Noraime however is so strong he sneaks back into the Alhambra gardens to see her and is captured. His transgression means he is doomed to be cast down a cliff unless a champion comes forth to fight Alamir for his life. To universal surprise a mysterious knight duly appears, takes up the challenge, and defeats Alamir. He then not only reveals himself as Gonzalve the Spanish general, but also produces proof that Octair was acting with the Vizier and his followers to deliberately discredit Almanzor. The traitors are arrested and Almanzor and Noraime reunited. Cherubini creates a work with real melodic interest and perhaps more open-ended forms than with many of his previous opera seria. In fact it seems to me a definite advance over much of his work of the previous two decades. By comparison a previous CD issue of Lodoiska, a "rescue opera" of 1791, struck me as cold and formulaic, despite the fervent advocacy of Riccardo Muti and his La Scala team - admirably captured by Sony Classical in a live performance. Although greater weight and experience is evident in the choral scenes I would concede that characterisation of the leading characters is not as well defined as in some of Cherubini�s earlier operas. In this respect a work like Medee is in certainly in a different league. Nevertheless there is much that is worthwhile here and the artists involved, by and large, do the piece justice. Almanzor should have a bel-canto warmth with heroic pretensions, to which Francisco Ortiz responds very pleasingly. I had not come across this Spanish singer before and I look forward to crossing his path again. He maintains a good line, and has sap in his voice, responding well to the text. Meanwhile his partner in love, Noraime, is taken by Margherita Rinaldi. She has all the notes, although there is a tendency for her voice to harden and become squally in the topmost registers. The roles of Gonzalve and Alemar are in the skilled hands of Jean Dupouy and Jacques Mars. Unsurprisingly they sound more at ease in the language, and Dupouy especially adds to this quality a fine voice with a ringing top register. He certainly sounds like a worthy champion for anyone. The remaining cast are more than adequate. Peter Maag is nevertheless the justifiable focus of this reissue, part of a series devoted to his valuable work in Italian Radio in the 1970s, resuscitating works from the late 18th and early 19th centuries. Although the sleeve-note writer at one point asserts: "Maag surprises us by the ease with which he manages to adapt, with outstanding results, to a repertoire that certainly was not among his favourites"
I can only conclude that he manages to hide his antipathy well! Incidentally, the notes remind us that one of his most valuable rediscoveries was Paer�s Leonora, subsequently recorded and issued commercially by Decca; I have cassettes of this recording, but did it ever make it to CD? Although the music of Les Abencerages is not especially evocative of the Alhambra, let alone Spain, Cherubini does include some quite attractive cod Spanish dances in the first act�s wedding celebrations. Each act also concludes with an impressive finale, building quite a head of steam in the first, which Maag controls admirably, bringing out much detail in the orchestral part writing. Just occasionally, for example the opening of second act, the orchestra are fallible in intonation, but there is nothing especially worrying overall. In general they respond admirably to their conductor. To round things off the 1975 radio sound is well transferred; warm but with detail preserved. A four-language synopsis is provided, but be warned; the libretto is in French only. In short, if it appeals, take the plunge!